Long empty road through Chihuahua on our way towards the border. March 3 – 10, 2019. It was morning and we had already been planning to move on when we got a knock on the van. Greg slid open the side door to see two Policía with machine guns standing outside. They were friendly – and I’m not sure if they were going to tell us we needed to leave or not but we told them right away, “Vamos a salir está mañana” (We are going to leave this morning). Despite the intimidating weaponry they really just seemed to be checking on us. They asked a few questions about the van, seemed satisfied with all our answers, and then left. We had been making our way back to the US for the past week. We had had lots more exploring on our agenda but as we left Xilitla the skies became cloudy and threatened unfavorable weather. We drove right past Sótano de las Golondrinas (Cave of Swallows – At 1092 ft it’s the largest known cave shaft in the world, deep enough to fit the Statue of Liberty standing on her own shoulders) realizing that a gray day wouldn’t make descending a cave very much fun, and that the swallows and parrots we were hoping to see return to the cave at sunset would have had the good sense to have never left at all under dark skies. 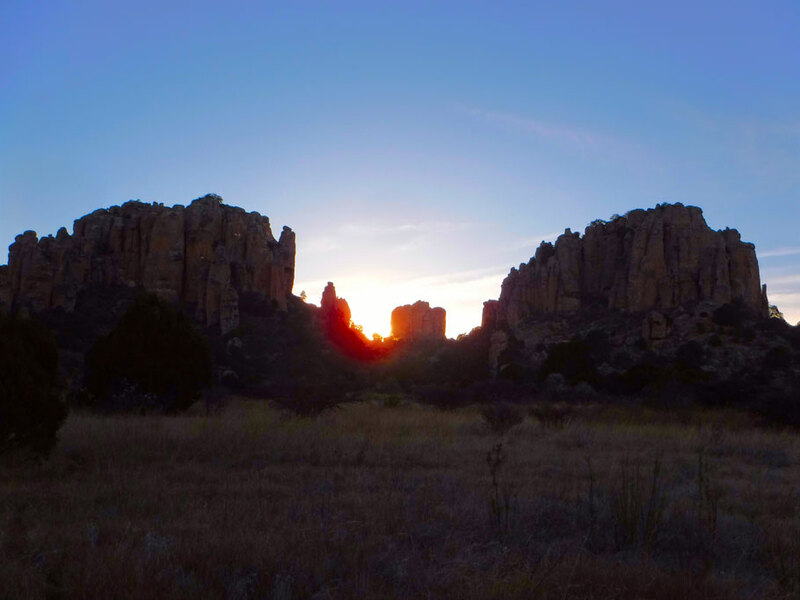 And besides the potential disappointment of the cave – the sun, just a hazy blur overhead, was giving little energy to our solar panels, which meant little battery power to keep our fridge and other electronics alive. It was better to drive and charge our batteries from the alternator. We pushed on to a campground near a waterfall in a little town named Tamasopo, but when we woke up the next morning to pouring down rain we decided to hit the road again instead of being cooped up in the van all day watching our battery drain and our towels mildew. We had already been thinking about the home stretch – how and where we would cross back into the US. We decided to leave the jungle and all the waterfalls behind and accelerate our journey back. 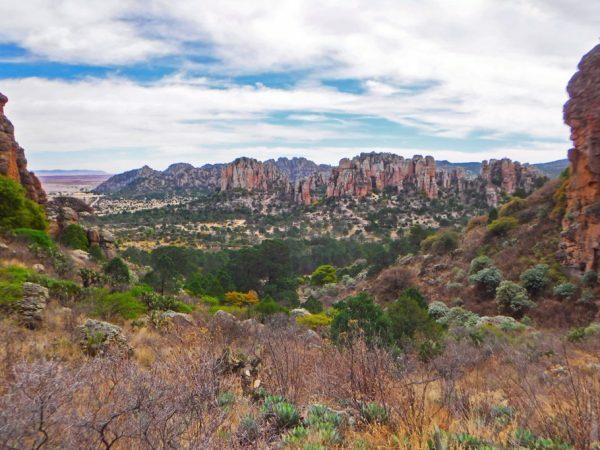 We picked out just a few interesting places to camp at the end of each long haul north on a route that took us through the states of San Luis Potosí, Zacatecas, Durango, and Chihuahua. Now that we were out of the central highlands and the jungle, the towns thinned out and wide open spaces filled up with rolling hills and mountains in between them. Life seemed to get quieter. The rows of endless souvenir stands dwindled. We saw fewer places on the side of the road selling hot food. There were fewer cars, and streets were wider. The highways were sometimes good, but also sometimes nonexistent – their strategy for improving them seemed to be to close down long stretches and completely tear them up, forcing cars and trucks to drive in the dirt next to where the road used to be. Driving through big cities was a breeze. We saw the names of big-box American stores we hadn’t noticed farther south. As we neared the border we saw more signs with English words. Restaurants advertised, along with their usual fare, burritos – a menu item we hadn’t seen since we left Arizona 3 and a half months earlier. 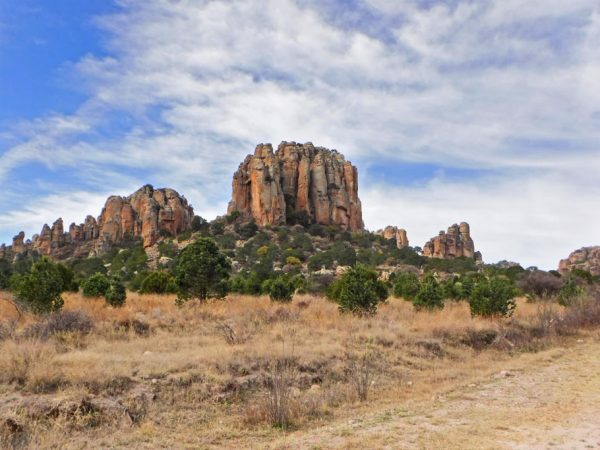 We had decided to cross at Agua Prieta, Chihuahua into Douglas, Arizona on a Monday when the Banjercito (where we would get the refund on our temporary vehicle import permit [TIP] deposit) would be open. But then we arrived at what would be our last good camping option, in Nuevo Casas Grandes, on Saturday afternoon. iOverlander showed two spots to camp, a lakeside camp or a spot at a restaurant in town that offered free camping if you bought a meal. The information for both sites was a year or more old. I thought the lake would be the easier choice – less difficult to get to (no navigating through town) and no having to communicate with our broken Spanish. Unfortunately, I was completely wrong on both assumptions. A raised dirt barrier with a ditch dug in the middle prevented us from getting to the location listed on the app. We turned around and tried to find another spot and ended up at another barrier dead end. We tried to drive to where we could see people hanging out on the lake shore but ran into another barrier. I decided to ask someone in garbled Spanish. And although he seemed to understand me and did try to give us directions, I didn’t understand anything he said besides “izquierda” (left). We drove up the road, made a left, and eventually found ourselves on the other side of the lake in a nice quiet somewhat secluded site right before sundown. Although we took a short walk around the perimeter of the lake and decided that we were in a good spot, at some point that evening I said to Greg, “Let’s just leave in the morning.” The banjercito is open at the Nogales border crossing on Sunday. Although it would be a much longer drive, there was no real reason to wait until Monday. As we left the lake and headed back to the highway Sunday morning I saw our heavily armed cops talking to someone in a residential area. We waved. The highway took us north, then curved west paralleling the US/Mexico border fence, sometimes coming as close as a half mile. 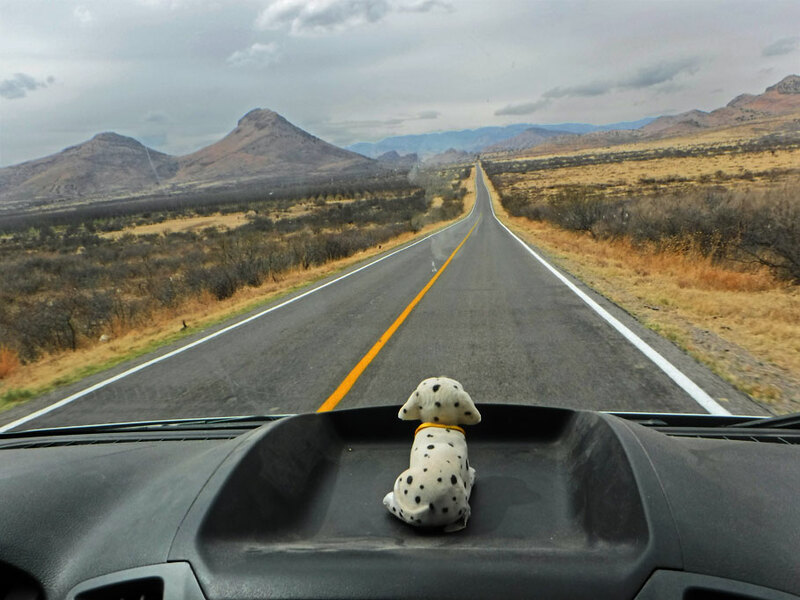 We passed by Agua Prieta and ascended into the mountains on a narrow winding road – what appeared to be the trucker’s route with the big rigs struggling their way up and down, going both directions en masse. Kilómetro 21 was a breeze once we figured out where to go (the other side of the highway from where we purchased our TIP), but up the road, we found a miles long line and a four-hour wait to get through customs. Hawkers worked the line selling the cheesy plastic souvenirs one finds closer to the border. The line grew behind us as we crept forward a couple of car lengths every 15 minutes or so. Husband and wives would take turns at the wheel so the other could leave the car, jump the highway barrier, cross the empty southbound lane, and duck into a break in the hillsides to find a secluded spot to relieve themselves. At the border, we showed our passports and chatted with the border agent. He sent us further up the line where we were pulled over and the van was searched. An agent asked us how long we were in Mexico. “Three and a half months,” we told him. “For work?” he asked. “No vacation.” His eyes got wide. But of course it was way more than a vacation, it was a journey along beaches, over volcanos, back to the ancient past, through great cities, into the jungle and the desert, taking in natural wonders, and enjoying the tastes, sounds, and visuals of a country so close and so far. But, I didn’t tell him that and just left him pondering what in the world one could do on vacation in Mexico for 3 1/2 months. * Click pics to enlarge/open into a slideshow. 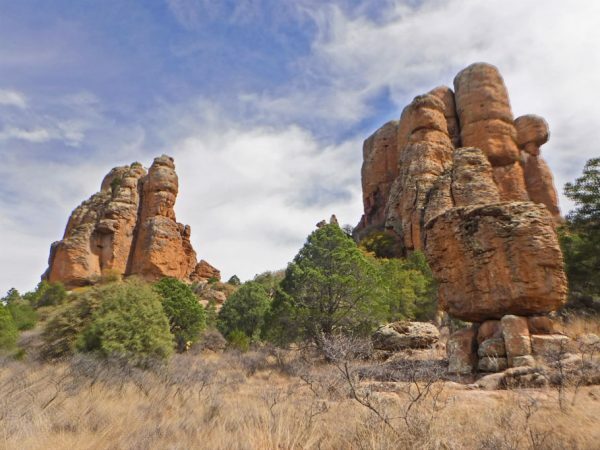 The rock features with tall shapes of organ pipes give Sierra de Los Organos its name. 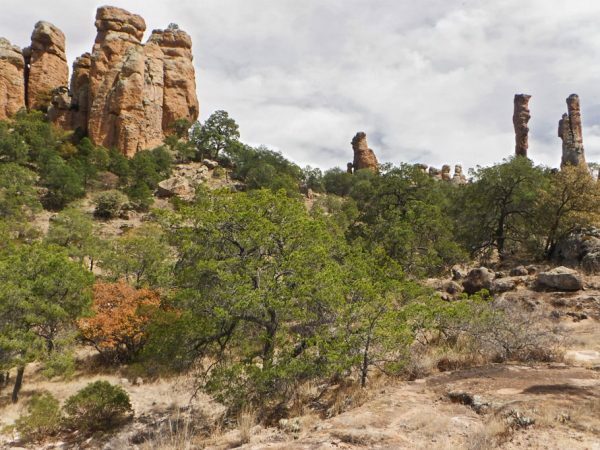 Sierra de Los Organos is a national park in the state of Zacatecas. We really enjoyed being back in the desert. 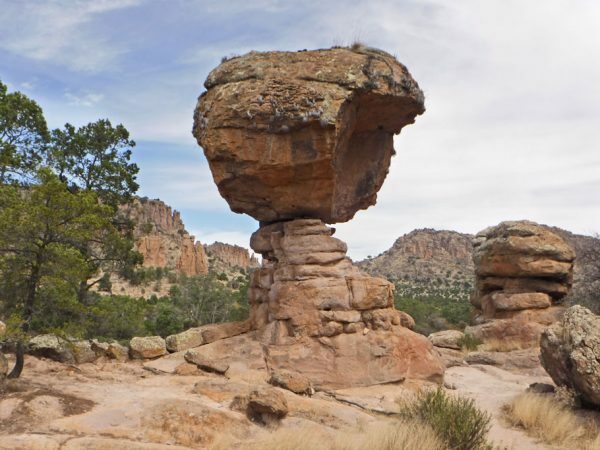 The rock formations here are very interesting. It was almost like being back in the States. We could walk around and explore without a guide. Back in Mineral de Pozos we saw evidence of Mexico’s progress under Diaz. Many did not benefit from the rule of Diaz; though. One of these was peasant Pancho Villa. Villa is a controversial figure in many ways. But one thing about him is clear. 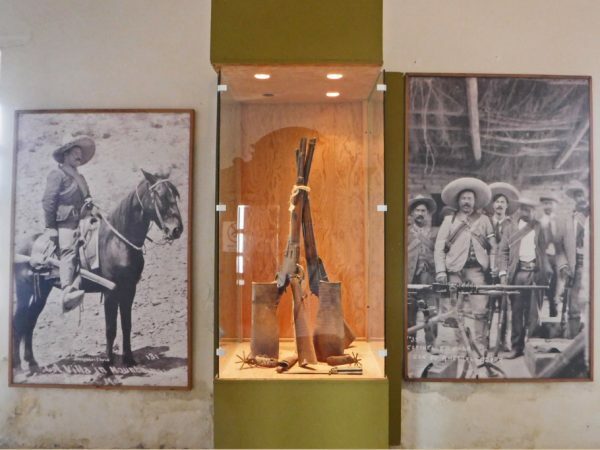 He represented the spirit of the 1910 Mexican Revolution. 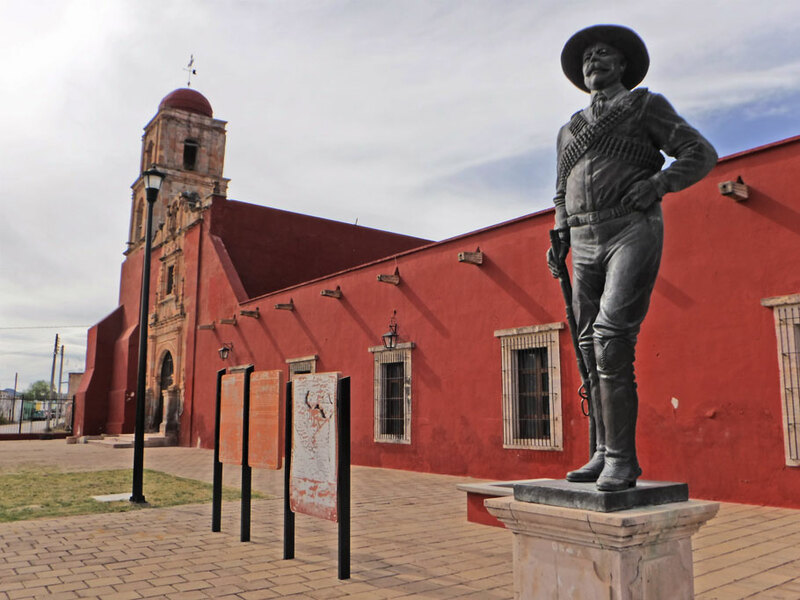 After leading revolutionary forces in northern Mexico, executing a raid in the US, avoiding capture by thousands of “Black Jack” Pershing’s troops, and wreaking general havok, Villa negotiated a ceasefire. He and his troops would settle at this hacienda near Hidalgo de Parral, Durango. It’s very nice here. We spent the night. 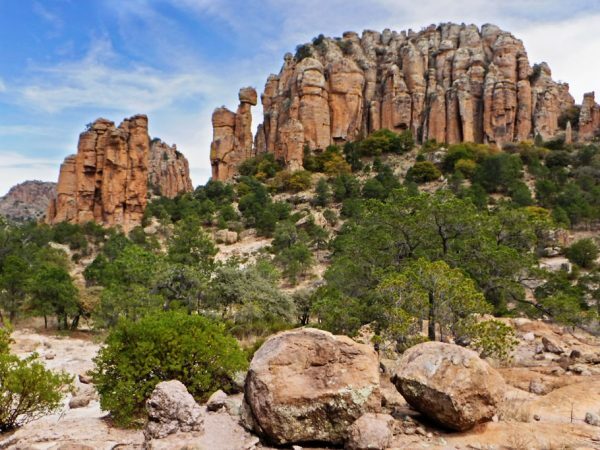 We arrived at Cumbres de Majalca, national park in the state of Chihuahua on a Friday. It was very peaceful. As we left on Saturday ATV enthusiasts were riding in for a weekend of fast driving and partying. Overlooking the lake from our camping spot at Nuevo Casas Grandes. This entry was posted in Chihuahua, Durango, Mexico, San Luis Potosí, Sonora, Travel On The Dirt, Zacatecas and tagged Chihuahua, Cumbres de Majalca, Durango, Mexico Border Crossing, Mexico Travel, Nuevo Casas Grandes, Overlanding Mexico, Pancho Villa, San Luis Potosí, Sierra de Los Organos, Zacatecas. Bookmark the permalink. What a journey you two have had! So happy to have been a small part of that. Fun adventures ahead! So glad you guys were a part of it too! One of the highlights! Fun adventures ahead for you too! Thanks so much for your wonderful Mexico blog. I read it out loud to Ed every time. So sorry we couldn’t catch up in Tucson. Ed is much better, slow but steady progress. Stay well, safe travels and keep on keeping on. Glad Ed is improving. So glad you have been enjoying the blog. So many times we went somewhere and thought – Meredith and Ed would love this! You are so totally welcome. Thanks for continuing to follow along after all these years! What a mess at the border! But, once the desire hits to return “home”, there’s nothing that can stop that. Like you, after spending many months in Mexico a lifetime ago, we suddenly had the urge to return as fast as possible and crossed a day earlier than planned. Without eating most of our food. It was the longest and most difficult overland border crossing we ever had, after a year in Mexico and Central America. Love the photos. Especially the ones back in the desert. So similar to Arizona! It seems like all of our journeys end quite suddenly – things start breaking or the weather turns bad and we just head home. I wish we had had more time to explore but I think part of my desire to get back to the States was because our time is always too limited and there is just so much I want to see and do in the Southwest this season before we have to head back east. Crossing the border is always a bit of an ordeal but this year was so different from our crossing last year in Mexicali- perhaps next time we will either wait or drive further to a smaller border crossing.